The Mexican Caribbean is in a state of emergency with the confirmation that a contagious lethal disease, White Plague, is attacking and spreading through colonies of coral. In response to the escalating crisis, a high-level meeting was held in Cancun this month. The meeting coincided with new information from research in Cozumel, Quintana Roo. 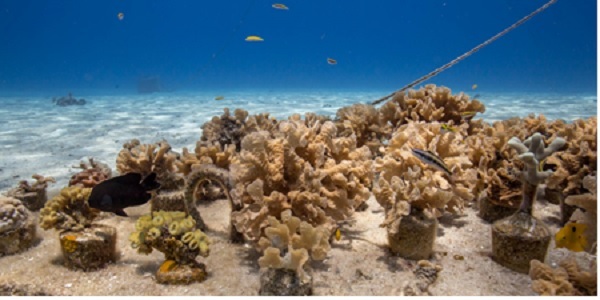 High-quality video footage from an underwater drone helped the Mexico National Marine Park Authorities and the National Commission of Natural Protected Areas (CONANP) identify and confirm the White Plague in the local coral. They teamed up with National GeographicÕs Open Explorer Expedition contributors, ÒRestore Coral in the Mayan Reef,Ó who supplied the technology OpenROV Tridents and navigated underwater drones to locations suspected of disease. Specialists from Reef Life Restoration Ocean Dive Teams supplied this vision of affected coral. It is not the first time the coral condition has been identified, however its presence in the Caribbean is a new development. First thought to be of bacterial origins and initially discovered in 1977 in the Florida Keys and then later identified there again in 1995, it is unsure how it has developed in the Caribbean. Clarification is needed on whether this is an independent outbreak or if it has spread from Florida waters. Recent research suggests that a virus rather than a bacterial infection causes the White Plague. A small, circular, single-strandÊDNAÊvirus (SCSDV) is thought to be responsible. Of particular concern is the deadly impact of this plague and the speed in which it can spread. The White Plague can kill a four hundred year old coral in forty days, killing significantly faster than coral bleaching. This could spell disaster for a region reliant on the environment, tourism and fishing industries for many livelihoods. The group concurred that discussion on The White Plague is hard to isolate from the wider problems of coastal water deterioration due to pollution and rising waters temperatures as a result of climate change. Other issues included inefficient, inadequate or non-existent water treatment facilities, disregard for environmental regulations, bad tourism practices, mangrove destruction and the excessive and unprecedented level of Sargasso in the region. In the last year, this seaweed has infiltrated many beaches in the Caribbean including MexicoÕs Riviera Maya, which includes tourist hotspots such as Cancun and Playa Del Carmen. The event was organized by the National Commission of Natural Protected Areas (CONANP), The Central American Commission for Environment and Development (CCAD) and Global Environment Facility (GEF). The assembly gathered a range of stakeholders and world leaders in environmental and marine protection including MexicoÕs Environment and Natural Resources Ministry – Semarnat and The United Nations Development Program Mexico (UNDP). The meeting resulted in the creation of a White Syndrome Action Plan to combat this serious threat. The participants of the action plan were broken into working groups focusing on specific issues: water management, fisheries, tourism, and coastal development. Outcomes and action points will be officially released in the next week. Who was in the working group? As well as the organizers others on the working group were representatives from MexicoÕs Environment Ministry – Semarnat (Secretariat of Environment and Natural Resources) and The United Nations Development Program Mexico (UNDP) as well as international organisations The Nature Conservancy (US), Adaptur GIZ (Climate Change/Ecosystems./Tourism Sector), Barcolab (Biodiversity and Reef Conservation), Resiliencia (para Areas Protegidas) and not for profit organizations, The Mexican Fund for the Conservation of Nature (FMCN), The Nature Conservatory, MAR Fund (Mesoamerican reef fund) and NGOÕs Amigos of Sian Kaan, Healthy Reefs, Reef Life Foundation, IntelliReefs and Restore Coral.